Process Explorer shows you information about "which handles and DLLs processes have opened or loaded". If you ever wanted to know what's launching all those svchost processes, or why a process has been launched then Process Explorer is the tool to reveal those information. It displays all processes that are currently running on a Windows system with hierarchical information, the cpu and memory utilization, and the company that has created the program. From here it is super easy to sort all processes by how taxing they are on a system. You can for instance sort by cpu load to find out which process is slowing down your system at that time, or by memory to find out which process is using up all precious system memory. A few interesting additions. The tree cpu usage column for instance can be helpful to determine the cpu usage of a program spawning multiple processes, like Google Chrome for instance (last column in the screenshot). 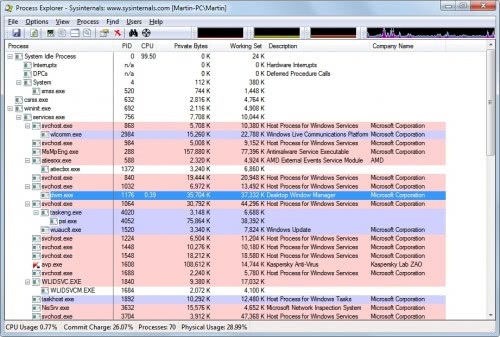 Process Explorer 14 is available for download at the official Windows Sysinternals website. It is also possible to run Process Explorer directly from http://live.sysinternals.com/procexp.exe.